Students, faculty, and alums fill Chapman Theater on the TU campus to denounce cuts in programs. More than 300 students, faculty, staff, and alums turn out for a protest against cuts announced at the University of Tulsa yesterday by President Gerry Clancy. It’s standing room only at Chapman Theater on campus. 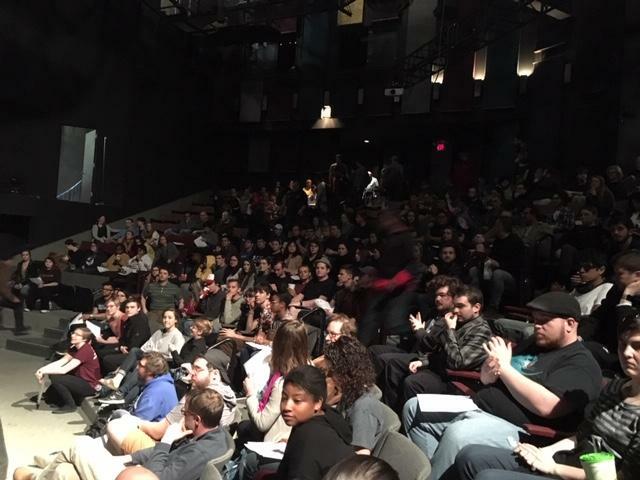 Jacob Patterson is a graduate of the TU Theater Department, and he says the cuts will affect many more than the 6% outlined by administrators. He says protestors will fight to have the cuts rolled back. Protests are planned for Good Friday and April 22nd, and there’s even talk about a possible sit-in or demonstration outside Administrative Offices. KWGS Radio is a licensee of the University of Tulsa.